Stuart Jeffery: Yalding: advance or retreat? Yalding needs a future. It is a superb village set on the banks of the Medway and Beult. It has a great community, some beautiful historic houses but sadly an awful lot of flooding. While Eric Pickles talks of building two 'garden cities', one of which is rumoured for Yalding (10,000 houses on a flood plain? [Post posting note: Tories are denying they have proposed Yalding and they suggest that it is the Lib Dems- see Stephen Paine's comments below... I guess we will find out in time!]) his counter part in Cabinet, Owen Paterson is cutting jobs and spending in the Environment Agency that are needed to protect Yalding with flood defences. 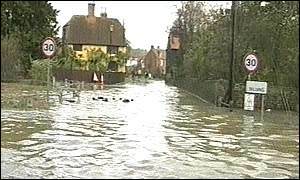 The flooding in places like Yalding is going to get worse - climate change means more extreme weather at increased frequency which for Kent in winter means more flooding. Yalding has two options, the government could invest massively in flood defences to fight Nature or it could move people away from the worst of the flooding. Moving people, and potentially some of the historic buildings in Yalding, may be a more difficult political pill to swallow but it could provide the only long term solution. I think it is time for an unbiased study into the options for Yalding, and other villages that suffer regularly with floods. Doing nothing is not an option. I think you should correct this. Eric Pickles had said he is not behind this proposal and he doesn't support it. Nick Boxes knows nothing about it, nor does Mbc. This is entirely an announcement from Nick Clegg and his side of the coalition. We think it's barmy. Clarification added above but I have no idea why you imply there is a difference between the Conservatives and Lib Dems!